Use this coupon code today to save 20% off your entire order from Baseball Plus. Act now and save $10 off your order of $50+ with this coupon code from BaseballPlusStore.com. Enjoy up to 60% off select accessories from Baseball Plus Store. 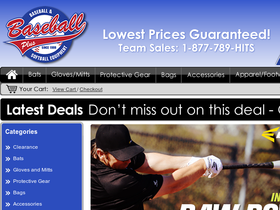 Check out Baseball Plus Store online for their latest special offers. Enjoy free shipping on orders of $99+ when you shop online at BaseballPlusStore.com. Shop sale at Baseball Plus for up to 75% off popular products.